← Measuring site engagement: A means that has become an end. Are you the owner of the image? Based on the policy notes supplied it appears something you have presented (like the image) might actually belong to someone else. Their response doesn’t seem to indicate this has anything to do with the ‘NSA’. I also find it unlikely that the NSA contacted Zazzle over intellectual property which is also in the policy notes. 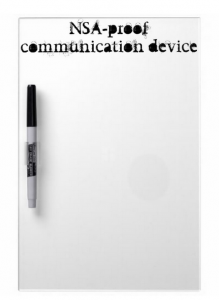 There was no image on my Zazzle product; it was only text. Oh wow… Is this claiming that using the NSA’s initial is immune to Fair Use? I’m pretty sure there’s nothing about that product that would imply that the product was endorsed by the NSA! I think the clause in question is intended to communicate that you can’t impersonate a government agency. It looks like Zazzle is just being paranoid. The FBI quoted a similar statute when asking Wikipedia to remove its copy of the FBI seal. Wikimedia pointed out that their encyclopedia article does not “convey the impression” of endorsement and refused to take down the seal, and the same defense appears to work here. Chris is right. No reasonable person could believe that the phrase “NSA-proof” could ever imply endorsement by the NSA, given what they’re up to. It doesn’t really matter whether there is really a valid trademark or copyright claim. The question is, just as in the Wikipedia case (Chris above), how the receiving entity faces up to it. When someone receives such notices, they might be better off challenging it, if deserved. The only problem in your case is that you did not receive the notice but Zazzle may have. And Zazzle took the easy way out I guess, rather than fight the biggies. Really, out of your sphere of control, don’t you think ? By the way, I think the product concept is brilliant.